Tanla SharpEye Lens (Super Wide Angle Flower, Portrait) for iPhone / iPad / Smartphones / Tablets : allputer.com - Accessories for all your Portable Electronics & Computers! The SharpEye Lens is an accessory lens with a +4 diopter which fits over the housing (clip)'s lens thread and can be installed and removed during the course of the use. It is a Distortion-Free, High Definition Lens, No dark Corners (vignetting), Super Wide Angle EF18mm Lens. This SharpEye Lens will take your smartphone photography experience to a whole new horizon. We are certain that this will be the best in terms of materials used, appearance and quality that you ever used for mobile photography. As the name "SHARP EYE" suggests, the photos taken with this lens are sharper, clearer, and more importantly distortion free because of our revolutionary design and advanced construction. To use this lens is as easy as putting a clip when you are hanging clothes to dry. Just screw in the lens, and press out the clip, carefully align with your camera and release, then you can use. Whenever you need the lens, just clip it on then you take fantastic pictures with your phone! 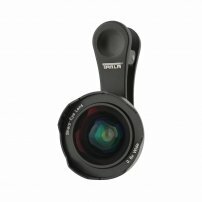 The clip is also compatible with our Mini Lenses, you can just buy a clip and buy your other favor lenses for the clip and add as many as stunning pictures to your social feeds. - Beyond comparison to the pictures edited by Apps, and you can keep a RAW copy for other purposes without claiming being edited. - Apple iPad Pro 11"
- Apple iPad Air 10.5"
- Net Weight: 45.3g approx.